The Village Belle is approachable and accessible, at the corner of the beach and the city in St Kilda. The Belle is accessible in a way most two-storey 130-year-old pubs aren’t - entirely. Renovated and relaunched in December 2017, the old pub has a new lease on life and is very wheelchair friendly. It’s completely step-free and visiting each area you’ll find they’ve been furnished with individual visual personalities. The front bar is a slightly refined take on a traditional boozer – elbows sit on the bar around a counter meal and a pint. 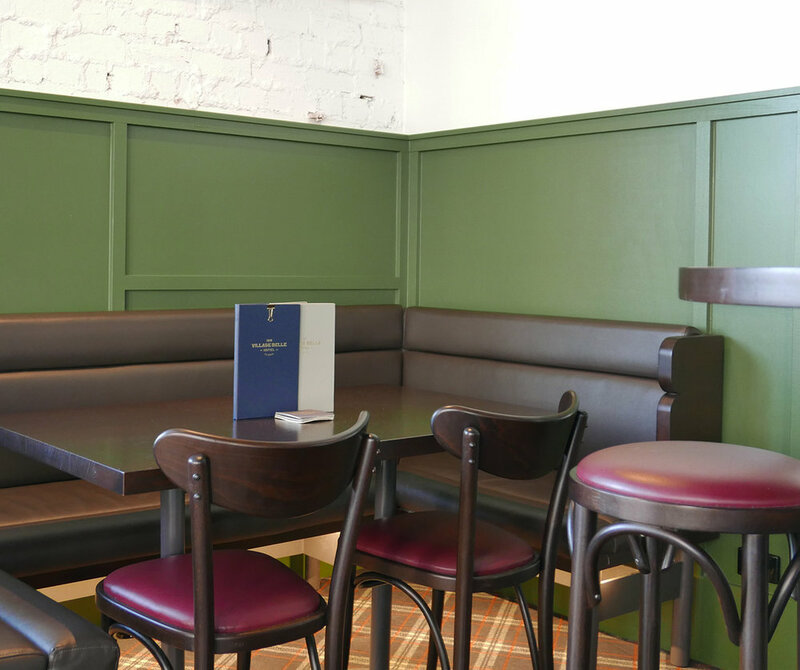 There are dark green, brass features with tartan and timber flooring. There’s pokies here and TVs perpetually broadcasting sport but spin around and you have the best view of St Kilda’s eclectic pedestrians – imported and local. The garden bar is a red-brick scented garden and has to be the drawcard here; it’s a welcoming with an enormous retractable roof and floor-to-ceiling windows. There are a few trees here that would dwarf one’s found at a local park. It’s a covered courtyard dining space where the long bar gets deep with people at peak hour. It’s the most wheelchair friendly spot offering step-free entry, dining options and an accessible bathroom close by, near the kitchen. There are low timber dining tables throughout with nooks and booths to prevent it feeling like a featureless hall. Take the lift upstairs and you’ll find the Dalton Lounge, a blue and pink post-modern inspired fit-out with cushioned seating and a well-stocked cocktail bar. Next door is a cool function room and between the two is the light-filled, wheelchair friendly bathroom. You can take in this upstairs vantage point by looking over the railing onto the garden bar. The architects – Technē; responsible for refits of The Terminus, Prahran Hotel and Botherambo among many others – seem to support a trademark look in their hospitality projects. They’ve bought common principles into the design here too; a respect of the existing site, evidenced by the expose brick, light-filled spaces and an appreciation of greenery. By law or by design – or probably both – the accessibility at Village Belle is excellent. Anyone with mobility issues is free to roam the bars and dining areas unimpeded. That is until punters begin arriving and enjoying the place too. Garden Bar outdoor dining area. View from the front bar. Village Belle from Acland Street. Padded booth seating in the front bar. Garden Bar signage looking towards Acland Street.